M1 widening finally finished | What Car? Ten miles of roadworks on the M1 are set to be cleared and the carriageway opened after three years. The works have been in place between the interchange with the M25 at junction 6a and junction 10 near Luton while the road has been widened from three to four lanes in both directions. The carriageways will be opened in stages, but are scheduled to be fully available from Friday, December 19. 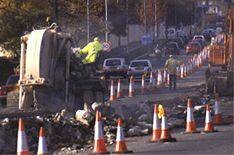 The work has cost 300 million and disrupted an estimated 160 million journeys. Temporary speed cameras have also resulted in fines and penalty points for 35,000 drivers.